“Fetch Lands! Need I say more! I wrote these words and saved them as a draft in WordPress over two weeks ago. Sadly, my sealed deck experience fell flat. And I’m not sure why. I went to the midnight pre-release, basically on a tiny little nap. I left early, about 10:30 PM, and wished I had brought a commander deck or something. I didn’t intend to purchase anything outside of basic snack needs. But the Tangled Web was slam dunk packed, and excitement was in the air. When it was finally time to break out the packs, I was happy to see a beautifully designed box, and got a nice pin to wear also depicting the symbol of the “Abzan Houses”. 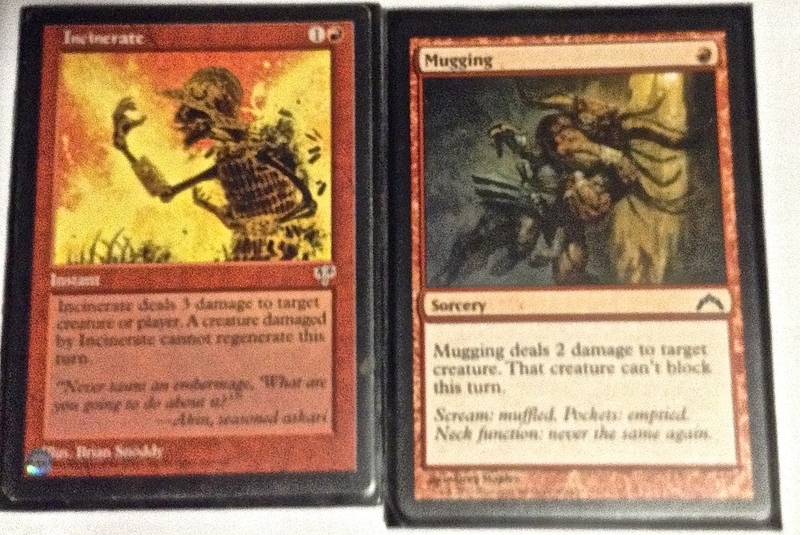 The weird thing about this particular format for sealed deck was how doggone SLOW it was. You pretty much have to play three colors, and mana-fixing is the number one priority. This means 18 cards of the 40 are boring lands. 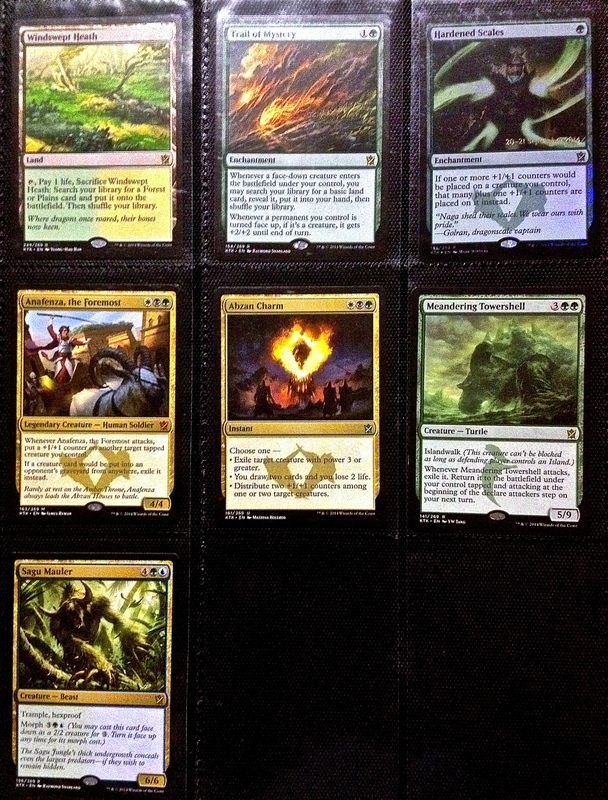 I was able to fix with “life gain” lands, however, three copies of “Jungle Hollow” and one “Soured Barrens.” As well as the “Abzan Banner” and Sandsteppe Citadel.” But all of these lands enter tapped, so that will slow you down. Then there is the opposite. “Windswept Heath” is very speedy! But combine this slow mana base with cards that ask for ridiculous mana requirements, and you get a slow, slow, slow format. Hub City Geeks, I’m afraid this was my final midnight pre-release. You are going to have to wait until Saturday afternoon when the next set comes out. I just don’t play that well during the day, much less in the wee hours of the morning! 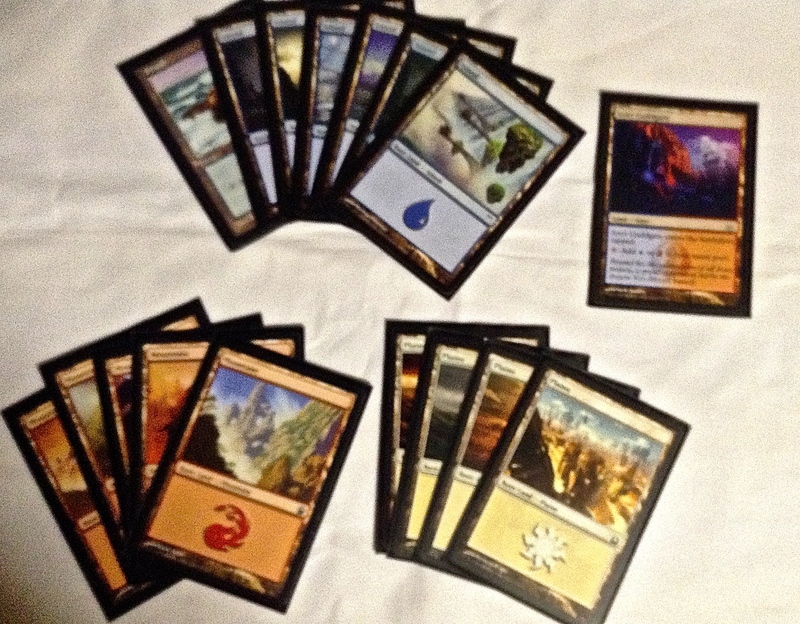 I am going to post a copy of all of the rares I got as they are in my trade binder, then say a word or two about them. “Windswept Heath” Especially glad to have this fetch land! I want MORE! “Trail of Mystery” was a good idea. It never showed up in all six matches of MTG I got to play. “Hardened Scales” I opted not to play this guy but instead to play Trail of Mystery. All I know about sealed deck is “keep it about the creatures” And enchantments don’t do anything if they don’t have creatures to effect. The art of this card is very pretty…this is the promo foil version. I like the idea of what this card does, however, and it is going to find a home somewhere somehow in my constructed decks. “Anafenza, the Foremost.” I believe Anafenza is meant to hate on “delve.” (With that mechanic, you exile cards from the graveyard as a cost for colorless mana.) The other ability goes well with “outlast.” (Outlast lest you pay a cost and tap a creature to put a counter on it. She lets you put an extra counter. She also gives them a counter when they attack) Because she is a potentially early bomb, she also got removed a good bit. “Abzan Charm.” OK, not a rare. This card is being touted as a potential top card in Standard and Modern. So here it sits in my binder! It is good removal. It is also a “sign in blood” for you. And lastly it can target two creatures giving them a 1/1 counter. If you are paying attention, then you know this will go great with “heroic” stuff from the “Theros” block! “Meandering Towershell” This is one of those cards…it makes you scratch your head. Like “Alms Beast” did in “Gatecrash.” WHY? Why should it be exiled when it attacks? Then come back during the attack phase next turn? I don’t see the point. You could LOSE THE GAME BY THEN. In case you are wondering. NO I DIDN”T PLAY IT! “Sagu Mauler.” Not in my colors. But a pretty good card. I may eventually try out the “sultai” graveyard strategy. It might be an enhancement to “junk” to add another color. I’m not giving up on “Kahns.” This time I was just unlucky, and maybe should’ve played on Saturday afternoon instead of midnight. I have already made a new “White weenie” deck with my new cards. We’ll see how that works out next time I get to play standard. Thanks for reading, faithful readers! Here is what it really is. It is one of those Coca-Cola coolers on wheels that you see in gas stations filled with ice and glass bottles of coke in the middle of the summer. It got its name because evidently at some point in its history it had decorations like R2-D2 on it, which have since been removed, but the name lives on. The store owner puts piles and piles of cards in the cooler, and mixes them up. If you just want some cards at any time, you just have to pay $5 for ten seconds to pull out a giant pile of cards. Some will be good. Some will not. This is the beauty of the game. You get a ton of cards more than you would for a booster pack, plus a ton more of rares. And the nature of this thing is that the cards are from all manner of sets and collections. You never know what you’ll get! This was the real key to my success. 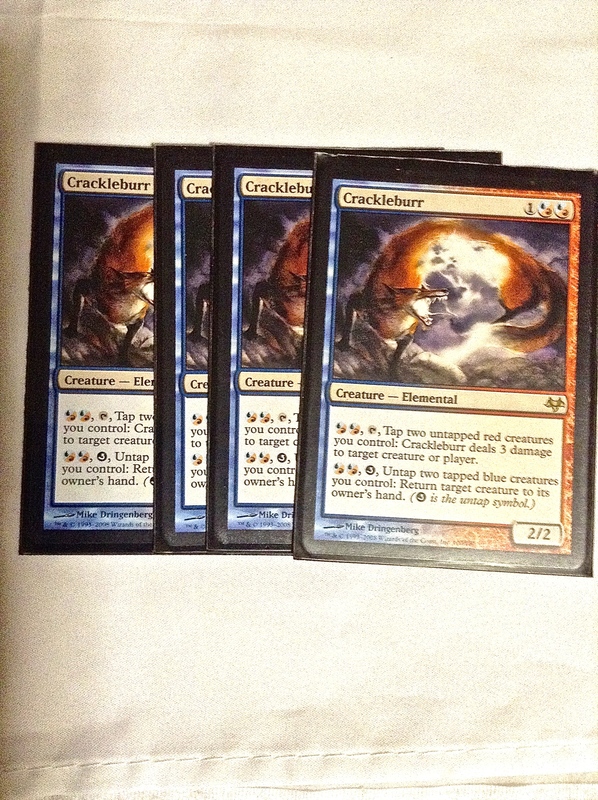 FOUR COPIES OF CRACKLEBURR! If my opponents didn’t remove them, then they would get hammered over and over. If they removed them because they are indeed annoying, then I would drop some bomb and they wouldn’t have removal then. I never saw this card before today, but I am certainly glad to add it to my collection! Sorry about the blurry picture. These guys were largely useless. And Panoptic Mirror was a mistake to add to this deck. I should have added some other chump or something. The thaumaturge just amounted to a chump blocker, as did the other guy. I could have played cheaper chumps, in other words. 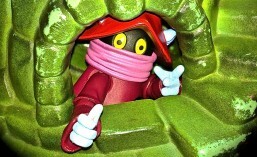 But sometimes these guys would coerce my opponent into removing them. They seem scary. Here are my best combat tricks in this deck. I had another Awe Strike in my card pool, but I didn’t play it. (Should have.) The creature card here made a land tap for any color. (mana fixing) Awe Strike could buy you some extra time and undo a burn spell. I would hold cloud shift until the right moment, and then blink a creature that something bad was being done to. I also used some burn spells. I used these spells sparingly, treating them as removal. I only burned an opponent out once. 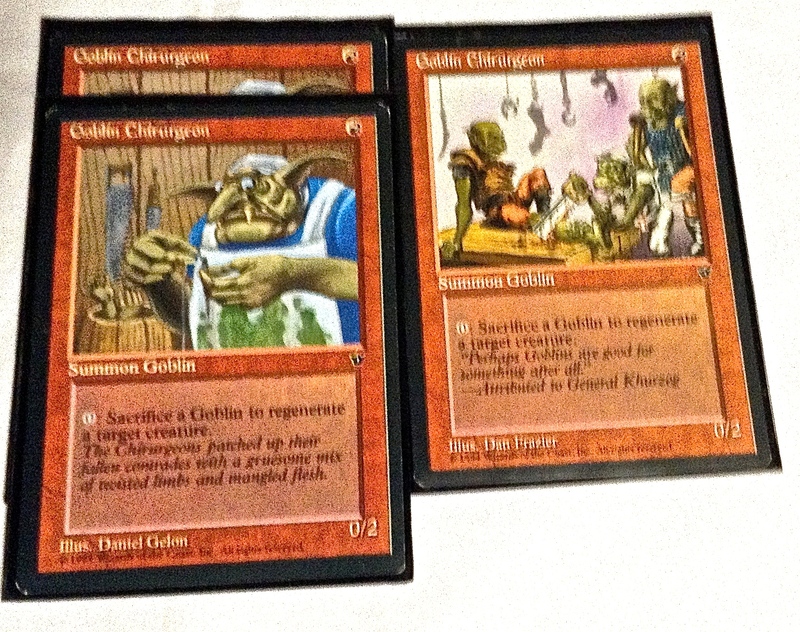 I got three copies of “Goblin Churugeon.” (I found out that that is another word for surgeon.) The goblin didn’t attack, as a 0/2. But sacrificing him or another goblin allowed me to regenerate one of the bombs if they happen to be targeted with removal. Here is the rest of my chumps. a couple of goblins and flyers. The Scalding Devil was a good mana sink. Only one fixing land here, Izzet Guildgate. In hind-site, I shouldn’t have played four plains. Two would have done the job. The tournament went down like this…NO ONE COULD BEAT ME! Only one guy, someone I never saw before named “Chris.” He beat me in round three, and guess who I had to face in the final round of the tourney? Yep. Chris again. In the middle of the match, he informed me that he played in the pro-tour France, so… The very last match, (the third of 2-out-of-3) was the first time I had mana screw. All I could draw were the stupid white lands! And his green and red based deck just flattened me! I never play blue and red. Why did I this time? The Crackleburrs and the goblins were good enough. I thought about trying something with “Sporemound” but didn’t really have the support. 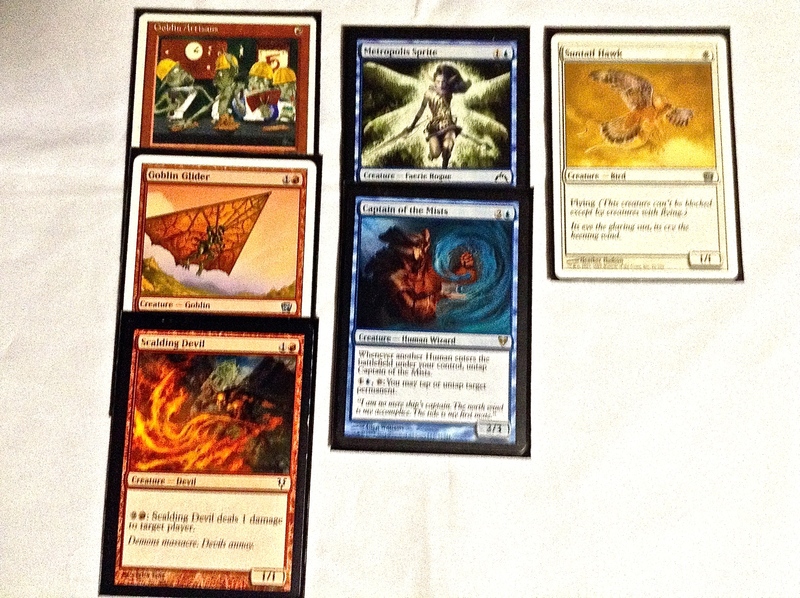 I had Goblin War Drums…a card Chris played and I didn’t like a dummy. My thinking was and enchantment like that is kind of useless in sealed. But in that case it really wasn’t. So I learned from that. Most of my artifacts were garbage. I had several crab things, but they were over-costed and really bad cards. One opponent looked through my sideboard as I played, and when my match was over mentioned that I should have sided “Circle of Protection: Green.” in the end. But I didn’t. I’ll know better next time! This small tournament was a great warm-up for tomorrow night’s pre-release for “Khans of Tarkir.” Maybe I will do just as good then! I will keep you posted, oh Hub-City Geeks!